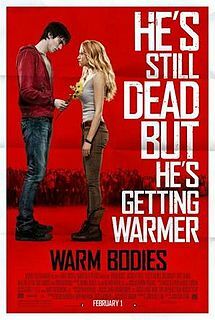 I am writing this post to tell you about the new film, Warm Bodies. I watched it at the movies yesterday and really enjoyed it. It was funny, sad, and romantic all at the same time. If you are a teenager, I highly recommend that you go see it. The movie is aimed for a teenage/young adult audience. Warm Bodies is set in a post-apocalyptic world where a zombie apocalypse has occurred. All the zombies are trapped in this enclosed city which is cut off from the rest of the world (or just America) by a large wall. The movie is narrated by one of the zombies whose name is 'R'. R lives among other zombies in an airport, and has a best friend named 'M' whom he communicates with by making grunting noises and sometimes managing to make out actual worlds. R's 'house' is an abandoned airplane at the airport which is filled with all of his possessions. The main food source of the zombies' is people and they eat human brains to gain their victims memories, this makes the zombies feel alive and more human-like. There are also these things in the movie called 'Bonies' which are skeletal zombies that have given up on trying to hold on to their humanity. They are not conflicted on eating humans or even zombies. When this girl named Julie, joined with a group of other young adults, go inside the walls, they are confronted by a group of hungry zombies, including R. R is attracted to Julie and spares her life, unlike how he ate/killed her boyfriend Perry, and he promises to keep her safe from the other zombies. He takes her to his airplane and keeps her safe, all the while she helps him to become alive again. The compassion that Julie shows towards 'R' helps the rest of the zombies to regain their humanity, and also leads R and Julie to have a romantic relationship. The movie shows the transition of R turning into a human, and how the zombies and humans join forces to fight off the bonies, helping the world to go back to how it was before the apocalypse. The film includes themes of comedy, romance, and action. Julie is played by Teresa Palmer and R is played by Nicholas Hoult. Other actors include Dave Franco, who played Perry, John Malkovich who played Julie's father, Rob Corddry who played M, and Analeigh Tipton who played Julie's best friend Nora. Jonathan Levine wrote and directed the film.